As summer months come to an end, you may have a natural pull to organize and clean your home in preparation for the kids returning to school and your schedule becoming more regulated. One of the areas where you find yourself the most is the kitchen. Whether it’s after-school snacks, preparing lunches each morning, or coming together as a family for dinner, the kitchen is the hub of your home. For that reason, it’s important to keep the area clean. You probably spend a lot of time standing at the kitchen sink washing dishes or wiping the remains of dinner off the stove, but do you know the six areas of your kitchen that need a deep clean right now? Pro-Tek’s ecofriendly household cleaning products can tackle each of them and keep your family safe. The stickiness of melting popsicles and chocolate covered fingers lines the shelves of your refrigerator. Because this is the space where much of your family’s food is stored, using a non-toxic all-purpose cleaner is a must in the fridge. 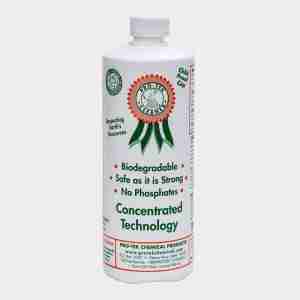 You’ll efficiently remove messes left from spilled juice boxes and spoiled veggies while keeping your family safe with a biodegradable cleaner. Between accidental spills and the family dragging in dirt from outside, your kitchen floors can quickly become a mess. Pro-Tek is the best way to clean a number of flooring materials. From wood floor or sealed marble, to linoleum and tile, the properly diluted concentrated cleaner can freshen nearly any type of kitchen floor. Have you ever pulled a dry good out of your kitchen pantry and wondered how crumbs ended up on the shelf? A dirty pantry and kitchen cabinets are one of the modern household wanders. Because these areas hold food, you want to use a non-toxic ecofriendly cleaner that will be effective but also safe for your family. Clear the shelves and generously spray Pro-Tek cleaner. Wipe away crumbs, liquids, and other residue. You can’t see it, but the mess on your kitchen countertop can contaminate your food and make your family sick if not cleaned appropriately. Trade out the bleach-based cleaner for a biodegradable option and spray the entire surface of the counter. Let the cleaner sit for a moment, loosening any stuck-on dinner remains, then wipe clean with a towel. Pro-tek’s antibacterial properties will remove the bacteria festering on the frequently-used surface. While the sink is often used for cleaning, it’s typically an afterthought when it comes to needing to be cleaned. (That’s what the leftover dish soap bubbles are for, right?) When you think about everything you do in and near your sink – clean raw meat, dispose of food products, and wash the unknown from little hands and fingers – it makes sense to frequently sanitize the area. An antibacterial, non-toxic cleaner can be used to wipe away grime and clean the germs you can’t see. Hit these six hotspots in your kitchen with an ecofriendly all-purpose cleaner for a mess-free start to fall and to keep your family healthy and germ-free.